OXFORD – Eugene Leonard left the arena Friday night with a gash on his chin, a jammed right hand – and a Class 6A, Area 13 championship. 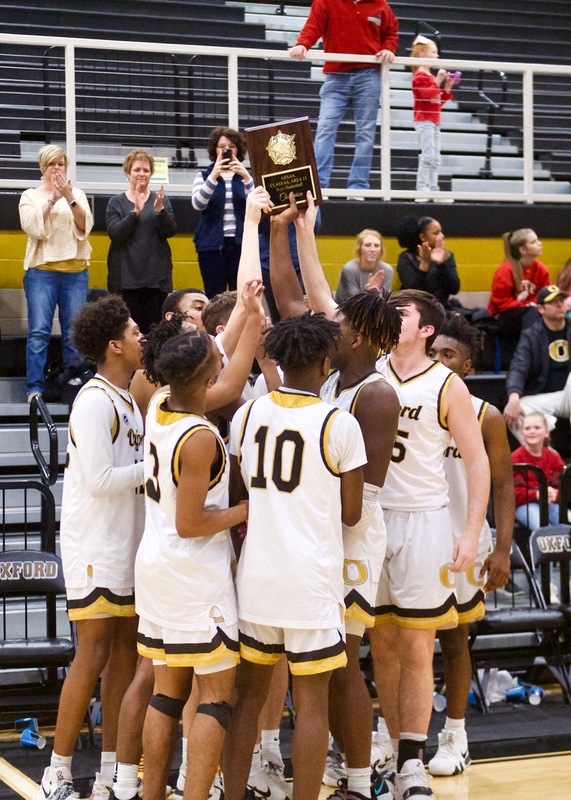 “He’s tough as nails, man,” Oxford head coach Joel Van Meter said of his senior guard after he helped the Yellow Jackets put away Albertville 62-58 for the area title. The gash on his chin and the jammed hand happened on the same sequence in the fourth quarter as Leonard fought for a loose ball, hitting his hand and chin hard on the floor. He exited the game for a couple of minutes, but he emerged from the bench with his team needing him to help them close out a pesky Albertville team. Along with leading Oxford in scoring with 17 points, Leonard made the play of the game to secure the win late in the fourth quarter after coming back from injury. The win sets up a matchup with Buckhorn in sub-regional round Tuesday night at the Sports Arena. Buckhorn lost by two to Lee-Huntsville in its area title game. The Yellow Jackets held an eight-point lead late in the game, but missed six free throws over the final minute to allow the Aggies a chance to steal the game away. Albertville’s sharp shooting guards Dane Harding and Brodie Canterberry hit big shots to pull their team within three with under 10 seconds to play. Harding finished with 22 points, Canterberry 21. Oxford sophomore Rok Taylor missed two free throws to open the door for the Aggies to snag a rebound and get a 3-pointer that would tie the game and send it to overtime, but Leonard stepped up, bandaged chin and ailing hand in tow, to tip a rebound to himself and force another Albertville foul with just seven seconds to play. With the pressure on after missing the first free throw, Leonard calmly sank the second to give the Yellow Jackets a four-point lead, putting the game on ice. Albertville chunked a desperation three at the buzzer that wouldn’t have mattered even if it had gone in. Albertville came out ready to play, stunning Oxford in the early going with a zone defense that befuddled the Yellow Jackets’ big men down low in a concerted effort to keep Zondrick Garrett and Rok Taylor from being difference makers. Albertville’s Chi Jordan hit two early 3-pointers – his only two baskets of the game – to give the Aggies an early 8-0 lead that elicited a quick time out from Van Meter. 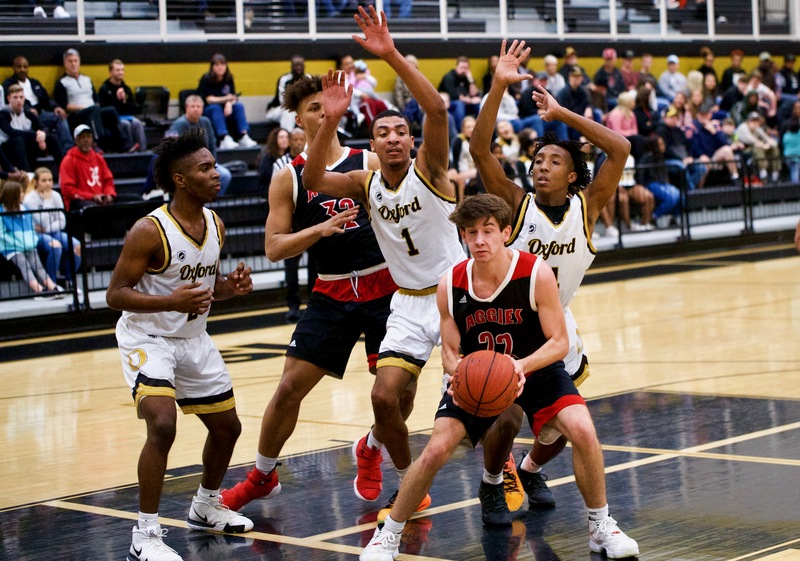 Oxford cranked up its defensive pressure after the sluggish start and forced several turnovers to get out in transition. Trailing by six midway through the second quarter, the Jackets finished the half on a 15-4 run to take a 33-28 lead into the locker room. No lead was safe for Oxford in the second half though, with Canterberry and Harding both scoring in spurts. 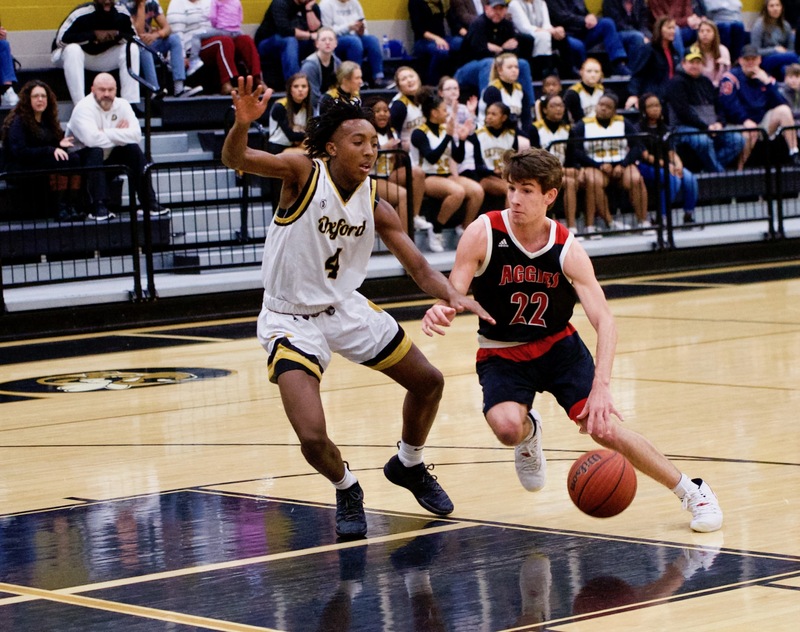 Canterberry continued to get to the rim at will, while Harding drained three 3s that seemed always to come as a counter to an Oxford run and kept Albertville in the game. Leonard was constantly there to pick his team up, however, whenever Albertville would get too close. Known more for his midrange game, which VanMeter called “money” after the game, the senior guard buried three 3s of his own, with two coming in the third quarter. One broke a 35-all tie and another at the end of the quarter to push Oxford’s lead to four. Even with the Aggies’ game plan centered around stopping Garrett and Taylor inside, the two big men still both scored in double figures with 13 and 12 respectively, while focusing on what they could do defensively to help their team in spite of the crowded lanes on offense. They combined to shut Albertville down inside, holding 6-foot-7 sophomore Trinity Bell scoreless for the game. After starting the season 3-3, Oxford has now won 20 of its last 21 games, including 10 in a row for the second time this year. The Jackets took home the County Tournament crown a couple of weeks ago, and now are moving to the sub-regional with another trophy for the case. 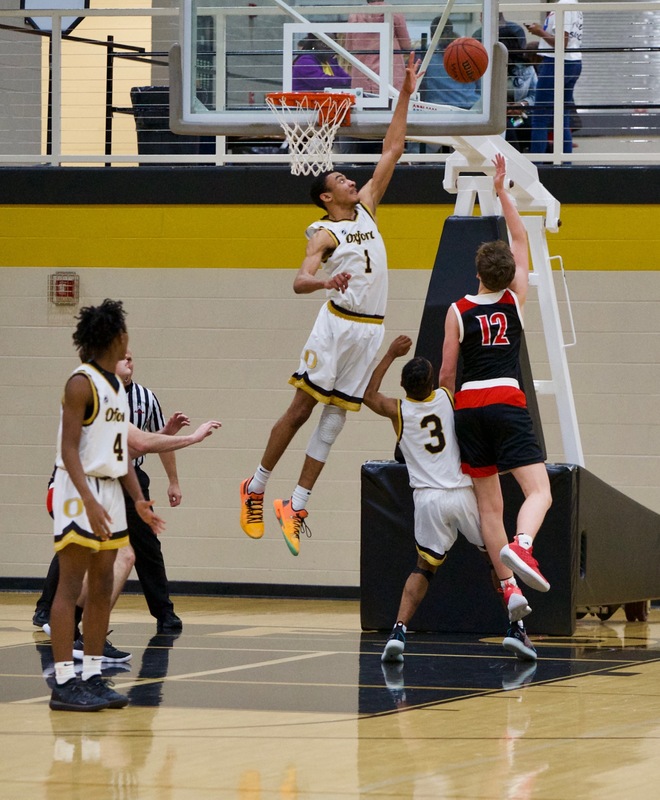 While there’s still a long and winding road between the Yellow Jackets and a State Championship, their confidence continues to grow as the wins continue to pile up. ALBERTVILLE (24-8) – Chi Jordan 2 0-0 6, Ben Allen 2 0-0 5, Dane Harding 7 5-6 22, Brodie Canterberry 6 9-9 21, Drake Bearden 0 0-0 0, Elijah Moss 0 0-0 0, Trinity Bell 0 0-0 0, J.C. Baker 2 0-0 4. Totals 19 14-15 58. OXFORD (23-4) – Zondrick Garrett 4 5-9 13, Eugene Leonard 6 2-5 17, Mont McClendon 2 5-6 10, Kobe Warren 2 2-2 7, Roc Taylor 3 6-9 12, Justin Moore 1 1-2 3. Totals 18 21-33 62. 3-point goals: Albertville 6 (Jordan 2, Allen, Harding 3); Oxford 5 (Leonard 3, McClendon, Warren). Fouled out: Jordan, Bell. Total fouls: Albertville 23, Oxford 15. Officials: Prociuk, Holmes, Paige. OHATCHEE – Nathan Higgins 1 3-6, Trey Pesnell 1 0-0 2, Grayson Alward 6 1-4 13, Todd Dover 2 0-0 4, Cameron Foushee 4 4-4 14, Bayley Tillison 0 0-0 0, Austin Wyatt 0 0-0 0, Briley Hale 3 1-2 7. Totals 17 9-16 45. WESTBROOK CHRISTIAN – Andrew Lockridge 2 2-4 7, P.J. Pirani 0 0-2 0, Grant Martin 3 0-0 8, Brandon Foster 0 0-0 0, Joseph Gilcrest 4 0-0 9, Jonah Morris 2 0-0 4, Bryce Wood 0 0-2 0, P.J. Wells 6 7-15 19, Jackson Luttrell 0 2-2 2, John Phillips 1 0-2 2, Ryan Scott 0 2-2 2, Seth Wyatt 0 1-2 1. Totals 18 14-31 54. 3-point goals: Ohatchee 2 (Foushee 2); Westbrook 4 (Lockrdige, Martin 2, Gilcrest). Fouled out: Presnell. Total fouls: Ohatchee 25, Westbrook 17. Officials: Thomas, Brand, Robinson.